Red wines. Chambertin, Graves La Tour Bicheau or a Corsica wine Armettu. Reds from Languedoc can perfectly accompany this recipe . Take 2 racks of young lamb. 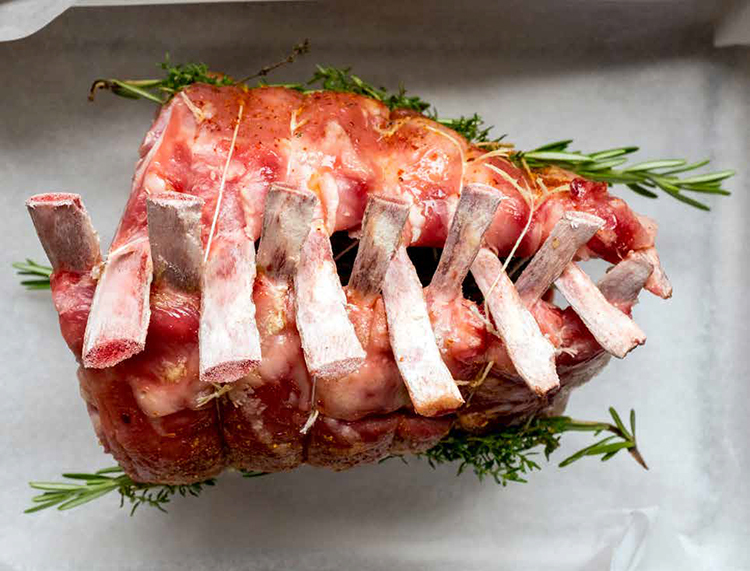 Tie them together by intertwining the ribs or ask the butcher to do it. Add up the herbs all over the meat held by the string. Apply with a brush a little olive oil, sprinkle with Espelette pepper. Cook them, starting cold, for 45 minutes at 180 ° C.
When cooked, drizzle some fleur de sel, pour a bit of water in the bottom of the pan and allow it to reduce. As an accompaniment, you can prepare minis zucchini gratins that you will cook together in the oven or warm over very low heat a pot of baked beans from Anne Rozès, canning company in Pays Basque. To accompany the meat, garlic cream works best as a flavor enhancer for the meat and zucchini gratins.